Metrolink rail line. Also the proposed alignment for the future California High Speed Rail. 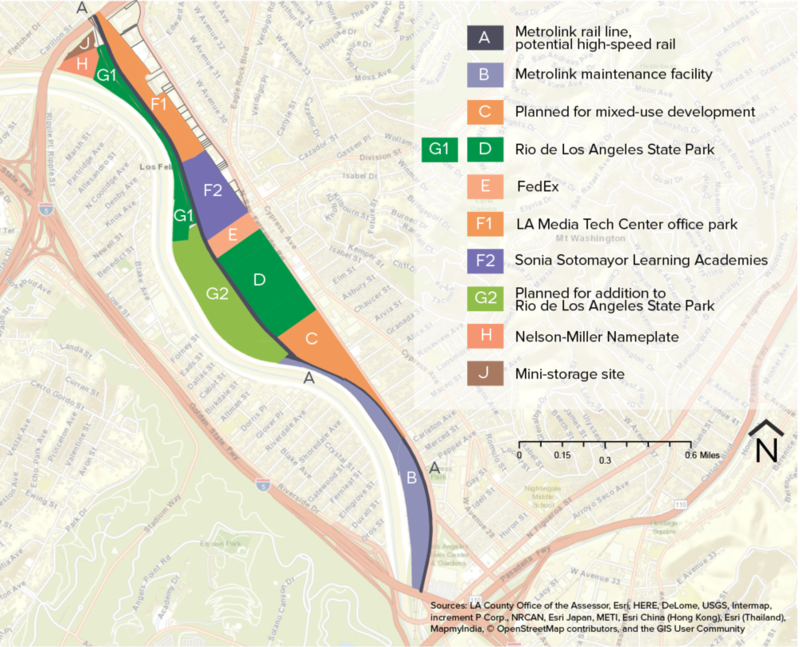 Should the High Speed Rail be built, additional property would be required to be dedicated to the project, and would likely reduce the footprint of the park space at Rio de Los Angeles and/or Parcel G2. The Metrolink Maintenance Facility was the first thing built at the site after Union Pacific abandoned it’s operating facility. It was built without public notice, creating much community outcry. This spurred a lawsuit and some of the early discussions and design proposals for the rest of Taylor Yard. The local community has more recently been engaged in dialogue with Metrolink over air quality impacts. Taylor Yard Transit Village was built under a joint development agreement between the MTA and McCormack Baron Salazar that called for affordable and senior housing options alongside 62k sq ft of community serving retail. The RiverPark development now includes 54 market-rate condo units; 108 senior units; and 155 affordable apartments, with 42 more to be constructed in 2019. 8,300 sq ft of commercial space remain empty and available for lease. Rio de Los Angeles State Park. This parcel is the first phase of the State Park and consists of active and passive recreation, habitat restoration, and educational and cultural facilities. Owned by State Parks. The City of Los Angeles has a $1/year lease on the active recreation areas. Facility owned by the Kramer Trust & operated by Fed Ex. Construction completed late 1997. Potential to provide additional compatible uses more appropriate its location between a park and a school if acquired in the future. The LA Media Tech Center office park was completed in 2000. LA City Planning conditioned the developer to work with The River Project to develop cutting edge stormwater BMPs before approving project. Now home to The Sonia Sotomayor Learning Academy which includes the Los Angeles River School, an LAUSD Pilot School that gives teachers, students, and parents a voice in public education. Owned by State Parks. This parcel will be phase two of Rio de Los Angeles State Park and will focus on habitat restoration and passive recreation. Currently serving as a venue for community-driven art projects and public education events. A former rail operating facility intended for future inclusion in the State Park, soil and groundwater contamination cleanup is needed. Purchased from Union Pacific by the City of Los Angeles with MICLA funds and a grant from the Coastal Conservancy. The Santa Monica Mountains Conservancy holds a protective easement on ~10 acres. Subject of decades of scientific study focused on critical flood hazard mitigation, floodplain reclamation, habitat restoration, water quality improvement, and passive recreation uses. Currently the site of Extra Space Storage and Nelson Miller Nameplate, two of the first projects built at Taylor Yard in the late 90s. A New York developer is proposing to replace these with a mixed use residential and commercial development at the site.